The Samsung Galaxy S III is a great-looking smartphone, and if you want yours to stay free of dents and scratches, you might want to get it a nice protective case. One thing you can do is to grab a cheapo silicone case from eBay, but if you don't mind spending an extra buck or two, many well-designed Galaxy S III cases can be found on the internet. Well, allow us to make things a bit easier by presenting you with a selection of Samsung Galaxy S III protective cases that we came across. Is there a particular design that you like? Then let us know by dropping a comment below. Also, if you can think of a great fancy protective case that we've missed, feel free to let us know. We start with a stylish case by Zenus sporting a design resembling a wooden surface. Open in up and you get compartments to store several of your credit cards. Here is a Galaxy S III case for all the ladies out there. It is not only lovely to look at, but its hard surface will also protect your beloved smartphone from every day wear and tear. The Glam Case by Case Mate was made for those who like sparkly things. Glitter, in particular, as that is what the accessory's back is covered with. It is available in four colors: gold, silver, emerald, and pink. And if brushed aluminum is a material you have a weakness for, this Case Mate offering might be worth checking out. It comes in silver or black. Those of you who like the premium feel of genuine leather might be interested in this flip-style case from Aranez. It is available in black or red, and once flipped open it reveals a compartment perfect for storing your ID or credit card. Here is another flip-style leather case, this time by the designers at Spigen. It comes in three colors: pink, blue, and brown. Sleeves, anyone? Mujjo has you covered. 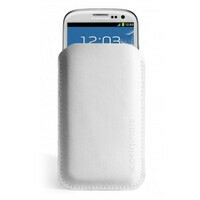 The Dutch maker of premium accessories already has protective Galaxy S III sleeves listed on its website, and will start shipping them before the month is out. The Crystal Rocked Galaxy S III protective case is a bling overload. It is hand-decorated with over 1,000 pieces of Swarovski crystals so people around you easily get an idea what your social status is. Is pink your favorite color? Is money not an issue? Then this protective hard-case might suit your fancy. It is covered with bling from Swarovski and features a pretty design on the back. In case you just can't pick a protective case, you can draw your own design and submit it to Incased. Your photo or drawing will be printed on a Samsung Galaxy S III case, making it a one-of-a-kind piece of art. The Case Mate Aluminium Brushed looks fantastic and it would go great with the pebble blue. lol i hope thats sarcasm. this case is awseome for samsung. That Aluminium one is awesome....! Mujjo is right up my alley! Case Mate's Phantom case is really great. And by internet, they obviously mean eBay or Amazon. Plenty of high end cases on both sites for far less than anywhere or any site unless you order from China direct. Yep, you can get the cheapo cases too, but it shouldn't come off as if that's all you can get from eBay. Today the trend of Glaxy iPhone is very high and everyone want to buy it. I love your facy Galaxy blog. Thanks for a very nice post.